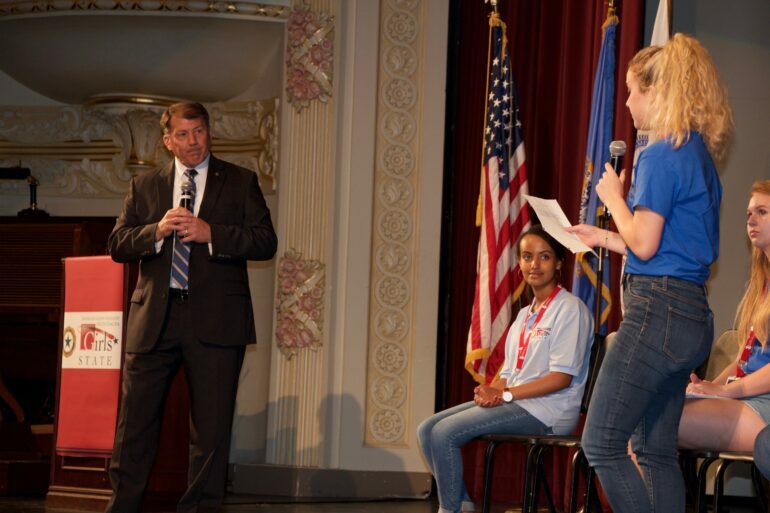 In a presentation to Girls State delegates, U.S. Sen. Mike Rounds spoke about entering political fields as well as the work force in general. Rounds made an appearance at general assembly in Aalfs Auditorium Slagle Hall Thursday morning. The senator was passionate about his job as a politician. For him, it is all about being able to help others. He encouraged delegates to be an active part of their communities and government in some way. “Rounds speech was very inspirational. He had a lot of good topics that teenagers and women need to hear,” said Vanessa Stein, a Seattle delegate. After his speech, he fielded questions from Girls State delegates. They covered a variety of topics from what delegates found important for the future of the nation as a whole to how they could get started in politics. Recently, controversy has surrounded the use of social media by public officials, President Donald Trump in particular. When asked about the role social media would play for a politician in the future, Rounds said it would continue to be a part of how they connected with their constituents. Rounds was also firm about being responsible regarding what he posts. In relation to the young women at general assembly, delegates recognized it can be hard to find ways to make the state better. The delegates were also interested in how to deal with the issues that impact them directly. As a result of the popular TV series “13 Reasons Why” bullying has become a more recognized issue in the United States today, particularly among teens. Rounds advice was to be more conscious of what is happening to classmates. “Report it. Get involved in the right way get the authorities involved. Fix the situation. Be clear that this is wrong,” said Rounds. These responses were well received by some delegates. “I really appreciated that most of what he wanted was to hear questions from us. Instead of talking to us about what he thought we wanted to hear. He spoke to what we actually asked. I really liked that,” said Bryn Ellwein, a Boston delegate. Other delegates enjoyed getting the chance to ask questions, too. “The security involved with his travel was my favorite thing he talked about,” said Megan Nepodal, a Philadelphia delegate.